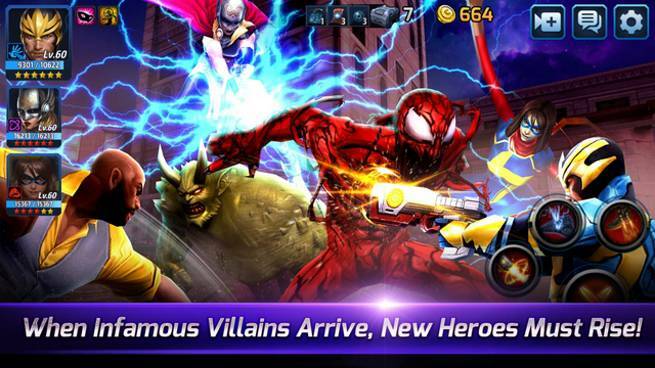 Three popular new characters from the All-New, All-Different Marvel comic book series: Ms. Marvel (Kamala Khan), Thor (Jane Foster), and Carnage join the latest version of MARVEL Future Fight. Never before seen uniforms: The latest version of MARVEL Future Fight includes new variant uniforms for Star-Lord, Green Goblin, and Luke Cage, all of whom have no pre-existing variant uniforms. Brand new skill sets: The Green Goblin, Vision, Hawkeye have received 6-Star skills. A “provoke enemy” effect has also been added to the third skills of Captain America, Iron Fist, Luke Cage, and Drax. Matchmaking system changes: The PVP system of Timeline Battle and Battle World now automatically matches the opponent against whom the players can fight most entertainingly. New monthly subscription biometrics package: This package allows users to select one biometric every day for a set period of time. Improvements to the user experience: The team management screen has been updated so that users can easily check on Super Heroes they own and form their own teams. Additionally, the user interface has been improved so users can readily change gear.